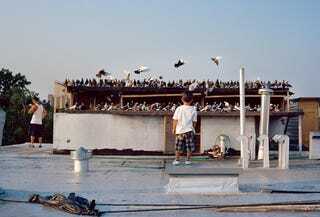 In the fifties, hundreds of guys kept pigeons, and swarms of birds flew above the city; some of them were flights, or “fancies,” the kind that can still be seen zooming around in big tornadoes above Bushwick or South Williamsburg, but many were ­homers, which fly lower and can find their way home from up to a thousand miles away. The sport isn’t as popular today, with younger people deterred by the cost (a flock of 100 birds costs its owner about $400 a month) and the time (at least two hours of upkeep a day). But pigeon racing stays afloat thanks in part to crops of newer immigrants from places like Eastern Europe and China, where, incidentally, a shipping magnate purchased a racing pigeon for $328,000 in January. Skubal had kept homing pigeons in Poland but never competed, although sometimes he’d lend his birds to other racers ­because he liked watching them return. Now it takes more to impress him. “It’s like when you open a business—the first million is a big thing,” he says, “After that, not so much.” Zak grew up racing birds with his father, and when he met Skubal in 2004, their relationship mostly consisted of his teaching Skubal everything he knew. The two men are aware that having such intimate contact with the 200 pigeons in their flock puts them somewhat at odds with other New Yorkers, whose prevailing view of the birds is that they spend their time either poking around oily puddles or crapping indiscriminately. But racers are used to outsiders not knowing, for example, that pigeons are incredibly intelligent, capable of learning to distinguish between a Monet and a Picasso, or that street birds, which racers call “clinkers,” have a somewhat unfair reputation for being disease-addled. Plus, racing pigeons look different. Seen up close, the iridescence on their necks practically glistens. Their feathers are silky. They have two legs, both of which are still attached to their bodies. Once you’ve been around enough homing pigeons, the clinkers, so covered in grime, start to look perennially out of focus. More recently, racers have had to defend themselves against not only the birds’ detractors but also animal activists. In April, with the sport’s reputation already struggling under the weight of its most notable participant, Mike Tyson (a picture of Tyson kissing a pigeon that made the social-media rounds was captioned “Why doves cry”), peta released a video. In footage apparently filmed with hidden cameras, people with blurred-out faces divulged how many ­racing pigeons never make it home (“We lose a third of them, normally”). “Tens of thousands of pigeons die,” Jeff Kerr, peta’s general counsel, tells me. “How would people feel if over half the entrants in the New York City Marathon died before the finish line?” More damagingly, the video’s narrator estimated that across the country, $15 million is bet on this “blood sport” every year. In New York state, the only kind of legal animal-racing gambling involves horses.